When you come back home at the end of the day, there are some things that motivate you no matter how tired you are. That's exactly why Subroto Bagchi's books have a special place on my bookshelf. 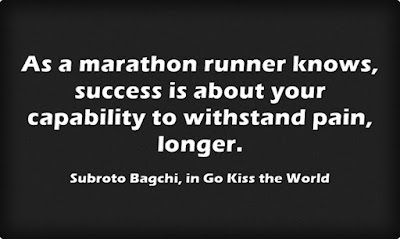 Often, I take my favorite portions from Subroto Bagchi's 'Go Kiss the World' and I share it as a kind of bed time story with my nine year old son. He waits eagerly for these stories! 'Go kiss the world' was his mother's advice to him as she lay in hospital, during her last moments with her son. These words from his dying mother became the guiding principle of Subroto Bagchi's life. In this book, Subroto Bagchi takes you through the humble beginnings of his life, with emphasis on his mother's influence on his personality and core values. Coming from a small town in Orissa, he tells you of a childhood that had no luxuries and how observing and learning from real life taught him to look at life - the challenges and opportunities it brings - with a sense of wonder. His father had a transferable government job. He writes in Go Kiss the World: "When my father was posted to Athamallik, the only government quarter available was next to the morgue where dead bodies were brought in for post mortem.While digging the earth to plan saplings, my mother would find what would look like human bones..." Imagine that! He cites a conversation in which he asked his father, "When will you buy a house?" "I already have five houses, why do I need one more?" His father replied. The five houses referred to his five sons. 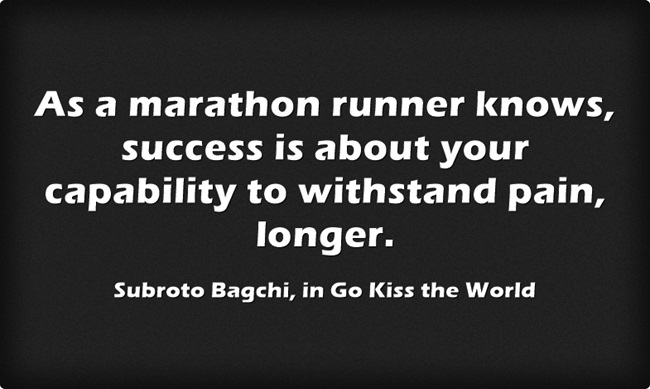 About his father, Subroto Bagchi writes in Go Kiss the World,"Material success did not define my father. He taught me that success is your ability to rise above your discomfort, whatever be your current state of wealth. Success is not about building material comforts..."
It's the kind of book I love to wrap up my day with....motivate my son with as well. From a spiritual perspective and packed with many practical insights for professionals, 'Go Kiss the World' is a book that is a must-read!